China's transition from an investment-led and export-driven economy to one that is driven by consumer demand will play out during the next decade as policies are introduced to enable reforms that encourage increased domestic demand. China's rise: Dynamics, trends, and implications. China's Economic Policy: The Search for a New Growth Model. China looks set to avoid the "middle-income trap". However, a shrinking workforce will depress potential growth, and the state-dominated economy will require reform if it is to deliver the productivity gains needed to enable China to catch up with most developed economies. In 2030 China's GDP per head will still lag that of the US. The closed nature of China's political system, which has in some ways served to support rapid development in the past, will become increasingly disadvantageous. In the absence of substantial political reform, the brittleness of the one-party system could be exposed by a political upheaval. A number of factors are behind China’s twin turbo dynamic, including rising wages in coastal provinces, which have forced some companies to look elsewhere, and increased infrastructure investment in the inland provinces, which has imposed access to these markets. In 2012, as the Chinese government moves from aggressive cyclical tightening to a more normalized overall economic policy, some of the cyclical stresses will be alleviated—helping to reduce the risk of the economy spiraling into a hard landing. China faces a number of challenges with its economy, including rebalancing the economy's growth away from investment and exports and more towards domestic consumption. China also needs to focus on improving support for private enterprises and on phasing out the dominance of state-owned enterprises (SOEs). A common misconception is that investment and consumption are competing agendas. In fact, a certain level of investment helps to stimulate and support consumption in the longer run. An example of this is social housing construction, which is a form of investment and an essential social safety net for many Chinese consumers. China's mass market consumers, approximately 400-500 million people in number, are crucial to the government's goal of increasing domestic consumption. This group has vast untapped spending potential. Social safety nets such as social housing, health care, unemployment benefits, and education that are provided to these consumers are intended to help them feel comfortable spending more and saving less. For China's economy to maintain a relatively high pace of growth over the next decade, it is important that gains in productivity are achieved. Studies indicate that a significant gain in economic productivity becomes possible when workers relocate from rural to urban areas. China's objective, therefore, is to move approximately 200 million rural residents to urban centers over the next 10-20 years, a feat that requires significant planning and investment. China’s growth is diversifying. China’s government began to place more emphasis with its proclamations to « Go West » in 2000 and « The rise of central China” in 2014. The actual statistical shift of economic power, however, began in 2003, as shown by the westward movement of China’s GDP center of gravity. Two economic transformations will affect relative provincial development. First, China’s economy is moving from one where manufacturing to one where services play an important role. Services share of Second, as its GDP is expected to rise from 43.4% in 2009 to 45:1% in 2014. Second, as its people get richer, Chinese private consumption will become a more important driver of economic growth. Private consumption’s share of GDP is expected to rise from 36.3% in 2009 to 68.6% in 2020. In effect, China’s workers will be producing fewer goods and services for foreigners, and more for their countrymen. There are an array of tailwind risks to China’s economic growth. There is a risk of asset bubbles bursting. Strains in local government finances are another worrying aspect of the current situation, as they could force cuts in spending on infrastructure. Tightening credit policy could also contribute to a slowdown in investment spending in 2010.. Meanwhile, the global economic recovery could reverse, hitting China’s merchandise exports, or domestic consumers could delay purchases if they become less optimistic about the future. All that said, China’s increasing economic diversity-and the government’s ability to stimulate the economy-means the likelihood of a severe nation-wide slowdown is low. More likely is that growth is derailed in certain pockets of the country, without widespread ramifications for other areas. One appropriate analogy is that China’s economy is not like a bubble, but a bubble bath. Any one bubble popping may affect a few other bubbles around, but will not drain the entire bath. China's public debt burden will remain manageable in 2014-15, but reforms are required to ensure fiscal sustainability in the longer term. The central government is gradually expanding the authority of local administrations to issue bonds directly; a number of additional regions were permitted to issue bonds in May 2014. This process may bring more transparency to local government liabilities. After depreciating against the US dollar for much of the first half of 2014, the renminbi has begun to trend upwards again. This is in line with The Economist Intelligence Unit's expectation that the currency will appreciate over 2014 as a whole, as well as in 2015. We believe that the risk of a sharp depreciation is low. China's four largest banks raised Rmb100bn (US$16.2bn) in debt financing in August 2014. They are set to raise much more in the near future through preferred share sales and other methods, as banking regulators pressure them to be more transparent about bad debts and to bolster their core capital. The decision to launch a corruption investigation into a once powerful former security tsar, Zhou Yongkang, may stoke concerns among other senior retired leaders, increasing the risk of factional strife within the ruling Chinese Communist Party in 2014-15. The government's reform agenda is ambitious and should help to reduce social tensions, but implementation will be tough. The Chinese economy is diversified in most respects, but the process of making it less reliant on investment as a driver of economic growth is likely to be a difficult one. A glut of excess real-estate supply poses a large threat. What is the PBOC up to? China’s currency has embarked on a path of appreciation against the US dollar after weakening sharply over the first five months of the year. This overdue reversal, is due to a policy of appreciation that has been engineered by the People’s Bank of China, in a move that went against its long-term goal of exchange-rate liberalization. Our expectations that the depreciation would prove to be a temporary phenomenon were right, and we maintain that that the renminbi’s value will rise by 1.5% on average against the US dollar over 2014 as a whole. The recent outlook of the Chinese currency indicate that the PBC has been keen to exploit the potential for volatility created when it widened the currency’s trading band in March 2014. That move doubled the permitted trading range about the mid-point figure set daily by the PBC from 1% to 2%. Going against the grain of both what many observers expected and market fundamentals, these movements have represented depreciation against the US dollar. The significant fall in China’s current- account balance from US $47.6bn surplus seen in the first quarter of 2013 to US $7.2bn over the first quarter of the year; combined with data from the IMF showing a dramatic rise in China’s foreign-exchange reserves between end-December2013 and end-March 2014, provides evidence that the Central Bank was buying up foreign currency to hold down the renminbi’s exchange rate. Indeed, the substantial scale of the increase in reserves suggests that the underlying upward pressure on the currency remains strong. Despite the slackening pace of economic activity in the first few months of the year, the weakening of the currency seems to have been a deliberate attempt by the PBC to unsettle market perceptions that renminbi appreciation was a one-way bet. The timing of the PBC’s approach seems to have been linked to the widening of the currency’s trading band. Indeed, the similar approach was adopted in 2012, when the trading band was widened from 0.5% to 1%. This approach can be characterized as a one-step back with a forward two-step move on exchange-rate liberalization. The strategy of the PBC’s is to give the market greater leeway in deciding the renminbi’s value. There are two factors driving this strategy: The cost that come with reserve accumulation which significantly complicates monetary policy; and the desire to allow the renminbi to become a global currency. Concomitantly, the PBC needed to step back from its moves to undermine the exchange rate and allow the currency to appreciate against the US dollar. The corollary of this policy are twofold: First, this appreciating trend is expected to be generally sustained throughout the rest of the year; and second, will try to introduce a degree of volatility within this overall path, including bouts of depreciation. The big question for investors and speculators is how long will this appreciation last? The consensus is that the short-term upward movement of the renminbi against the US dollar will not lessen the uncertainty of the medium-term outlook. The logic of this consensus is based on two empirical facts: a steady picture of declining current-account surplus, and the fall of China’s massive trade surplus-a phenomenon that will be accompanied by ever-larger outflows on the services and income accounts. The combined impact of a current-account moving into deficit by 2017 and an increase in capital outflows, will be to put the renminbi under downward pressure and the actual fall of the currency against the US dollar by 2018. Firms should be aware that the exchange rate is likely to be significantly more volatile in the coming years than it has been in the past. Companies with exposure to exchange/rate movements should ensure that they are properly protected. Foreign companies should adopt strategies such as hedging or trading directly in renminbi. The Chinese government will need to allow the development of more innovative solutions in local financial markets to ensure that domestic enterprises can also find ways to adapt to a less predictable exchange rate. SGE’s research and reports are not meant to provide individually tailored investment advice. They have been prepared without regard to the circumstances and objectives of those who receive it. E-finance in China: Growth Opportunities and Challenges Ahead. Riding a wave of an exponential growth over the past five years, Internet finance companies in China is now providing a growing range of financial services. Government have recently adopted a range of supportive policies to ensure the ultimate, intended twin goals of E-finance: Improving financial inclusion and accelerate the process of interest rate liberalization. However, the achievement of those goals may prove difficult in the face of a slew of concerns ranging from consumer protection, the regulatory environment and the long-term viability of internet finance firms’ business models. The development of the internet finance sector is likely to yield dividends ranging from a substantial gains in innovation and productivity, and could help bring a smooth transition, much-needed transition of the Chinese economy toward a more consumption-based growth model. World-class research and analysis that provide Occasional “think pieces” on themes of current interest to Institutional Investors and market participants. 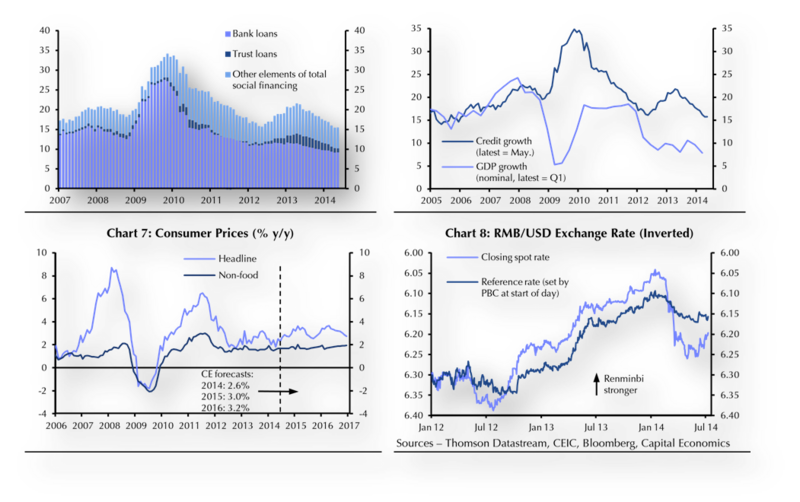 China: A cautious Monetary Stance. 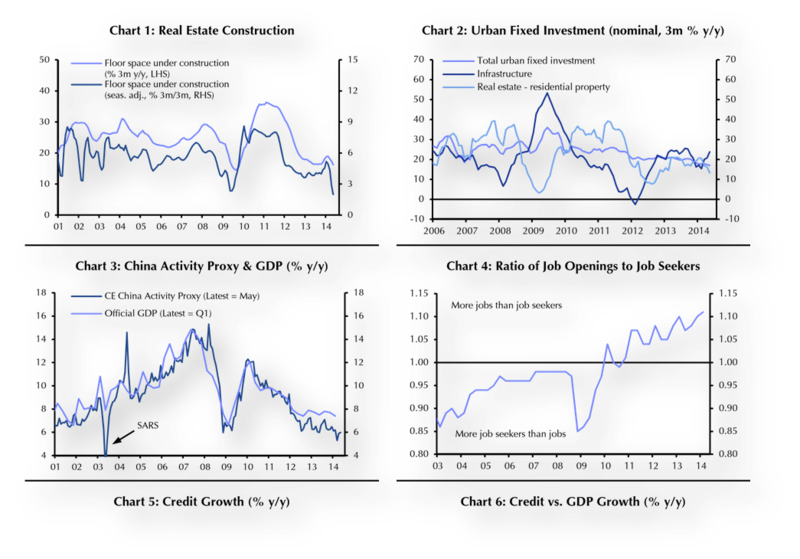 China: Assessing The Prospects of Growth in the near term. Winning strategies of multinationals in China. The Renminbi: The Political Economy of a Currency. Assessing The economic impact of Chinese Trade with Latin America.